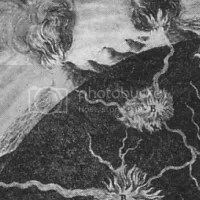 Between mid-December 1631 and the end of January 1632 Mount Vesuvius produced its most violent eruption since that of AD79, a VEI=5 event that included central vent and radial fissure eruptions, pyroclastic flows, lahars and volcanic tsunamis. The eruption killed perhaps 4000 people, sweeping away the villages at the foot of the volcano and severely damaging a number of larger towns including Torre del Greco, which was perhaps two-thirds destroyed and where most of the fatalities occurred. This eruption had a major impact on contemporaries throughout Europe, giving rise to an upsurge of interest in the study of volcanoes. Among those drawn to the close scrutiny of Vesuvius was the Jesuit priest and polymath Athanasius Kircher (1609-1680). Despite having had his youth in his German homeland disrupted by the Thirty Years War, Kircher had shown early promise in the sciences and by the early 1630s he was known for his work in mathematics, mechanics and magnetism. From 1633 he worked in Rome as a scholar and teacher, and in 1637-8 he travelled in the south of Italy investigating earthquakes and volcanic phenomena including Etna, Stromboli and Vesuvius. While visiting Vesuvius he climbed all over the mountain making observations, even having himself lowered by rope into the crater. From 1638 onwards he devoted himself to research and writing at the Jesuit Collegio Romano, one of the intellectual powerhouses of early modern science, producing a vast number of publications on subjects including music, astronomy, linguistics, archaeology, magnetism, mechanics and geology. Kircher’s interest in geology, and particularly in volcanoes and earthquakes, bore magnificent fruit in his Mundus Subterraneus, published in twelve volumes between 1664 and 1678. Kircher postulated a central source of heat at the centre of the globe, and produced a stunning cross-section of the Earth (included in volume III of his work) showing a central mass of flame feeding heat to the surface through a complex network of channels and fissures and subsidiary bodies of fire distributed through the interior. Volcanoes were created where the Earth’s internal fires escaped at the surface, and also served to draw in air to sustain those subterranean fires. The source of the combustion was the combining of salt, sulphur, bitumen and other inflammable and explosive materials within the Earth. The idea of subterranean fire innate to the Earth developed during the fifteenth and sixteenth centuries as a means of accounting for the presence and distribution of hot springs; its application to the problem of volcanoes was a natural development, significant for reflecting an awareness of volcanoes as a global phenomenon produced by a global process, rather than the purely localized product of wind action upon deposits of combustible materials. 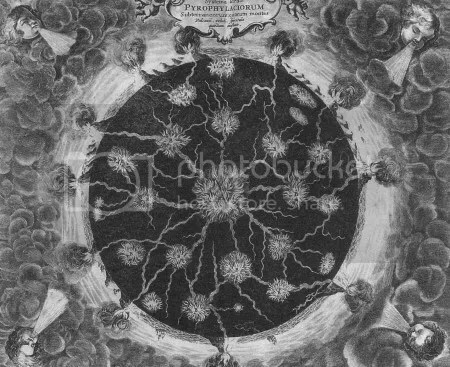 Kircher’s very influential work can be seen as playing an important part in the dissemination of this notion. When we speak of the igneous rocks of our own times, we mean that small portion which happens in violent eruptions to be forced up by elastic fluids to the surface of the earth. We merely allude to the sand, scoriae, and lava, which cool in the open air; but we cannot obtain access to that which is congealed under the pressure of many hundred, or many thousand atmospheres. We may, indeed, see in the dikes of Vesuvius rocks consolidated from a liquid state, under a pressure of perhaps a thousand feet of lava, and the rock so formed is more crystalline and of greater specific gravity than ordinary lavas. But the column of melted matter raised above the level of the sea during an eruption of Vesuvius must be more than three thousand feet in height, and more than ten thousand feet in Etna; and we know not how many miles deep may be the ducts which communicate between the mountain and those subterranean lakes or seas of burning matter which supply for thousands of years, without being exhausted, the same volcanic vents. Charles Lyell, Principles of Geology (1st edn., London: John Murray, 1830), vol. I, ch. XXII, p. 396. Above our heads, not more than 500 feet away, was the crater of the volcano. 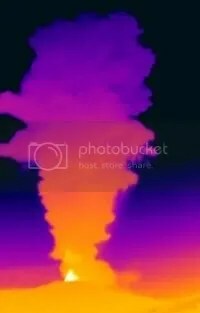 Every quarter of an hour there came flying from it a tall column of flames mixed with pumice-stone, ashes, and lava, together with a deafening explosion. I felt the whole mountain heave every time it breathed, sending out, like a whale, fire and air through its enormous blowholes. Below, on a steep slope, layers of eruptive material could be seen extending 700 or 800 feet down, meaning that the volcano couldn’t be more than 2,000 feet high. Its base was hidden by a real basket of green trees, amongst which I distinguished olive and fig trees, plus vines laden with purple grapes. It didn’t look much like the Arctic, I had to admit. Jules Verne, Journey to the Centre of the Earth, translated by William Butcher (Oxford: Oxford University Press, 1992), p. 210. Near the tip of the southern peninsula, Sorrento commands a wonderful prospect of Mount Vesuvius across the entire Bay of Naples. From this steep-sided town, Vesuvius looks almost the perfect, gentle-sided cone. It could be a domestic version of Mount Fuji, the revered volcanic cone in Japan. It can appear blue, or grey, or occasionally stand revealed in its true brown colours. On clear days Vesuvius is starkly outlined against a bright sky: a dark, heavy, almost oppressive presence. Or on a misty morning its conical summit can rise above a mere sketch or impression of the lower slopes, which are obscured in vapour, as if it were cut off from the world to make a house for the gods alone. Richard Fortey, The Earth: An Intimate History (London: Harper Collins, 2004), p. 3.